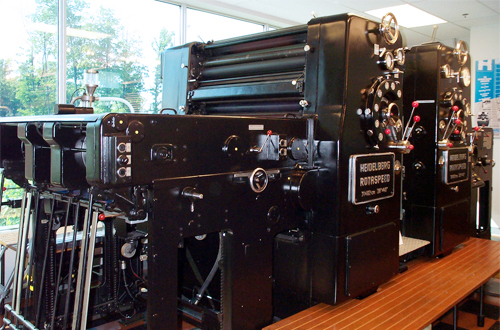 Built in 1967, this Heidelberg Rotaspeed may not seem to be old enough for the museum. But, it’s included for a reason. This is was one of the last to leave the Weisloch factory with a chain transfer design. 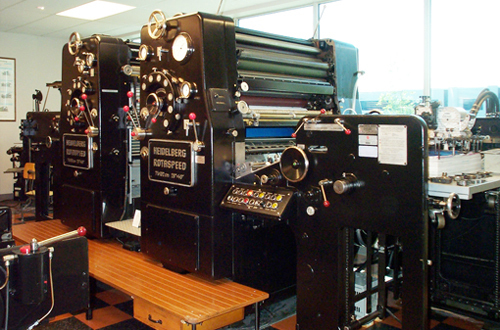 Originally, in the early sixties, Heidelberg experimented with a chain - afterall, Faber & Schleicher had been very successful with their Rolands. Besides, chains were much cheaper than a drum and gear. At first, Heidelberg tried using the standard delivery gripper bar. That was disaster. Then, they tried a Suluminum special material. Finally, with constant register problems, they gave up and built the Rotaspeed as a cylinder and gear transfer. The Rotaspeed is not a happy memory for Heidelberg to this very day, and was quickly replaced with the hugely successful Speedmaster in 1975.